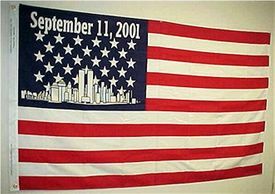 This commemorative flag tastefully remembers and honors the victims and heroes of 9/11 by displaying the New York City Skyline and the date of September 11, 2001 against the field of stars. These flags are made of high quality 110 denier polyester and have brass grommets for durable displaying. Each flag is printed in beautiful color and makes a great way to remember 9/11. Display this beautiful flag on the anniversary every year or even year-round. Made of 110 denier polyester. Make sure to check out all our great Patriotic Gifts for our complete selection of 9/11 items.